We've read your entire report Syeonyx and are having trouble understanding what you've written. We are dealing with it seriously, but due to the current circumstances, a new investigation team cannot be dispatched! We cannot verify that any of this is true, however the images you also included do show some form if disturbing events currently going. If you are able to provide irrefutable evidence which we can prove has not been perpetrated by you, we will evaluate the need to send a second team! This may be hard to understand, but look at it from our perspective: a single person living alone in an unusual land finds mysterious goings-on, whilst every other man out in the field seems to be performing as expected. We're not saying anything against your current performance, however we are not overly impressed by what you have achieved so far. "provide irrefutable proof..."!!! I found an underground temple, explosive creatures, vicious spiders and a strange figure running around causing havoc and they want "irrefutable proof..."!!! What more do they want; images of me moments before a Creeper scatters me across a hundred metre patch of grass! I can't believe it! They were denying the existance of something when there's evidence staring them in the face! I was furious! I decided that I needed to take my mind of things, but I wasn't in any mood to do anything to help put money into the pockets of HoN Co.! I decided to go down to the ship, fetch some equipment and vent my rage against the archery target I had still set up from weeks ago! I felt sorry for Chiron because he seemed to want attention and was rather put out by the fact that I ignored him! I'll make it up to him later, but for now, I had rage that needed venting! I made my way down the staircase from the porch towards the farm; maybe the smell of fresh open soil would alleviate some of my anger, and I went to check on the wheat. It wasn't growing at the moment, but then again I had only planted it yesterday... Before setting out to the gate, I checked the mineshaft surface entrance to make sure it was still secure; it was, and the barricade just behind it still stood in one piece! I walked off towards the gate, admiring the wall; even now long after its erection, it still amazed me how quickly I had thrown it up! It was a very secure barrier, hopefully secure enough to take a direct hit from a Creeper. I suppose it's a good thing that they hadn't come through the wall, otherwise it would have left the entire area open to everything! I neared the lever and was about to pull it when I heard a flapping sound! At first I thought it was the sound of a cape... the cape of the hooded figure, maybe!!! I couldn't find the source, until I noticed a small, white piece of fabric or paper sticking out of the join in the gate! I pulled on it carefully and removed it, only to find it was a piece of paper with words on. At the top it had the words "May Rears' Guide to Survival" and at the bottom, a number "8"... 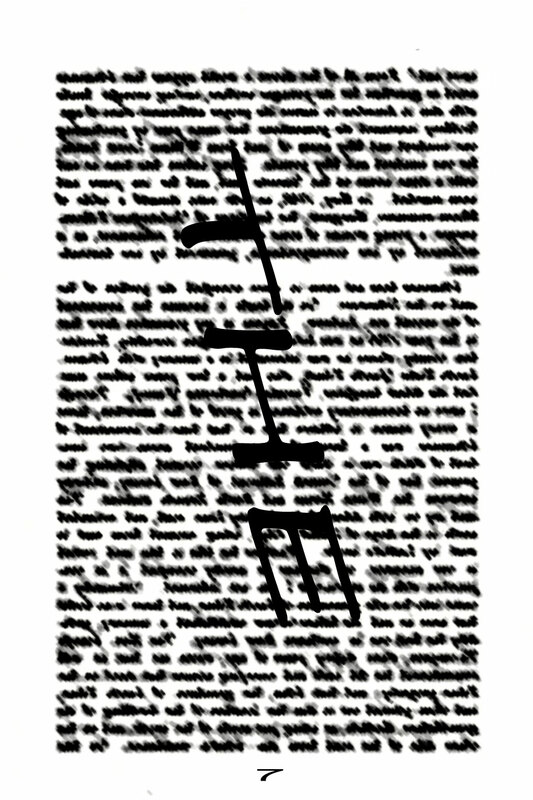 Wait a minute... this was a page from a book! I turned it over and instantly saw one single word; written horizontally across the paragraphs on the other side was the word "ALONE" in black ink. I looked down at the base of the page to find the number "7" printed at the bottom. This page... it had been ripped from one of the books I had gone through yesterday! What is this? Is this another message? Is this meant for me? Who am I kidding, of course it's for me, who else is here! That means that I'm not actually alone! Is this from the hooded figure? If so, what is he trying to tell me? 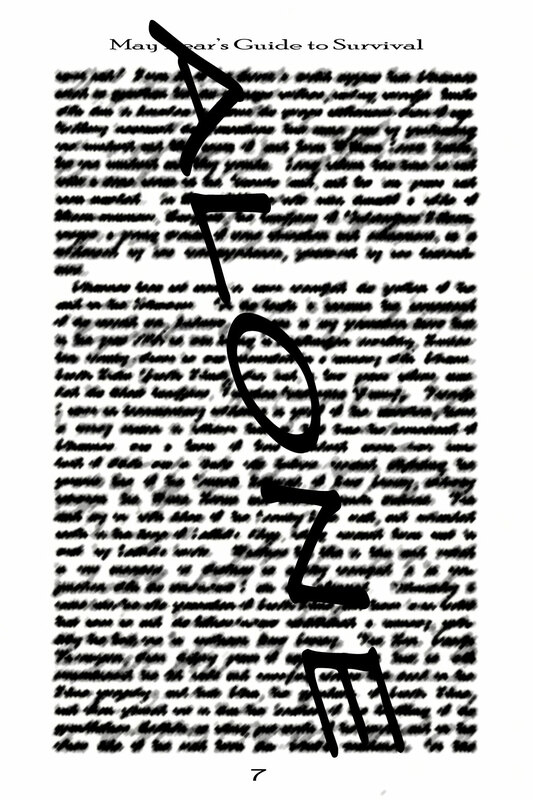 I stood there, staring at the page for quite some time, trying to get any meaning from this single word! "ALONE"... what did it mean...? What, or who, is it referring to? I stuffed it into my bag and tried to cast it from my mind, but all it managed to do was dredge up the current events and I started making wild connections!!! Needless to say, my anger had almost completely fizzled out... I decided that even if I didn't want to randomly shoot arrows all day, a good sweep of the ship's equipment and supplies might result in finding something more useful! 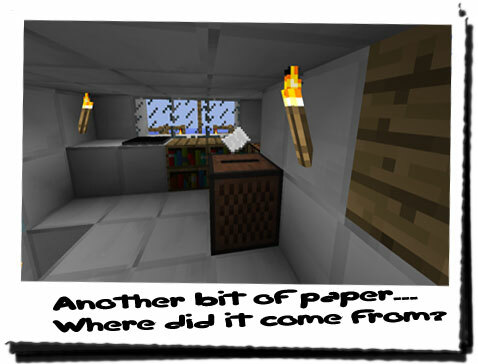 As I stepped onto the boat, a piece of paper flew past me from the galley and to the right, near to the stairs down to the crew's quarters! I walked over to the box and picked up the piece of paper... another piece of paper with the number "7" written as the page number, however this time there was another word written across the page: "EAST"! This was taken from a book called "Baron Von der Gardno's Gourmet Survival Cuisine"... I took the other piece of paper from my bag and compared them: they were both written with the same style and obviously the same pen. The words possessed letters with a thick styling. The two words "ALONE" and "EAST" made no sense! Was someone sending me a message? If they were, I really wasn't getting it...I put them both into my bag and went to search through the supply crates. I found a huge stockpile of torches that I could use, as well as metres of track for a minecart or other supply transport system! I could use this to connect the forge to the half-way point from the open-cast mine, that way I'd save a lot of walking! I left the rails for the time being, and put the torches into my bag. As I ascended the stairs to the main deck, I saw another piece of paper fluttering in the breeze, caught against the side of the door! I dashed to catch it, but the wind got there first, and it flew out of the ship towards the pier! I watched in dismay as it fluttered away, until I noticed it got stuck in the boat moored to the pier! 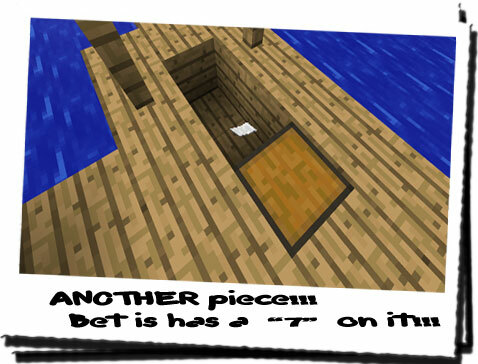 I dashed down to the boat, and picked up the piece of paper that had sat next to the chest! Once again it was another page torn from a book, more importantly, the seventh page. 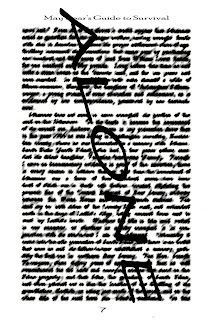 And on the seventh page was the word "TOWARDS" stenciled across it in the same style as the previous two! This was getting very worring! Someone was sending me a message in pieces! Then it occurred to me: they are the pages torn from the books I picked up... of the 10 I took, 7 had the same seventh page missing. Each of the pages I had found was the seventh page... That meant logically there were 4 other pages missing, and therefore 4 more parts to the message!!! So far I had "ALONE", "EAST" and "TOWARDS"... What order did they go in? I put them all into my bag, and I checked the chest for anything that might be in there... perhaps another page? But there was nothing; I had removed everything when I had returned, so I left the pier to go back to the house, making sure I closed the gate before leaving. All along the way to the house, my mind was doing somersaults all over the place! I couldn't focus my thoughts, no matter how hard I tried... I got to the porch and saw Chiron had made himself comfortable near the stairs. He greeted me with a bark and sat up on all fours panting! I chuckled to myself and decided that I might as well have some fun. I went inside to get the ball I had taken from the ship ages ago and returned outside. When Chiron saw the ball he was instantly on his feet, jumping around! Then I noticed it; where Chiron had been lying was another piece of paper! That made four! I picked it up, seeing that title written at the top: "Wildlife Revealed: A Look at Minecraftia's Lesser Creatures", with the number "7" written again at the bottom of the page. 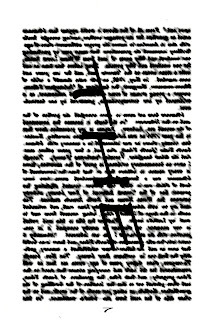 This time, the page possessed a simple three letter word "THE"... I stared at it, and dropped the ball as I got the other three from my bag! The ball must have rolled off the stairs, because Chiron shot off... I went back into the house, and to my bedroom, where I laid the four pages out on the bed! "ALONE", "EAST", "TOWARDS" and "THE"... what did they mean? I guessed i had more than half of the message now, but it still made no sense... The only partial sentence I could make was "TOWARDS THE EAST..." but that was it! Was it a message informing me of a direction? I thought about it but there was nothing towards the East of the walled area except the access to the wall. The strange cliff system was on the Eastern side... was that what this message was referring to...? I didn't know! I'm more confused now than I was a few days ago!